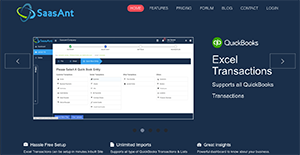 SaaSAnt is a platform that simplifies the process of moving your Excel transactions to or from QuickBooks Online or delete your XLS/XLSX/CSV file transactions more easily and quickly. SaaSAnt comes with a detailed and intuitive dashboard as well as multiple file upload capability. Users can import multiple files with multiple sheets easily and asynchronously. Once a sheet is already inside the system, you can monitor the progress at any given time in the header task bar while going over to the next upload seamlessly. SaaSAnt also lets users preview and change the data they entered online online using the system’s simple yet powerful data grid. SaaSAnt gives you absolute control over your imports with their delete feature, a function that helps ease your worries in case you uploaded the wrong data. What makes SaaSAnt the ideal transaction import, wxport and delete tool for QuickBooks Online? For one, it has Excel Transactions, a capability that provides you with an interactive dashboard that throws various insights on the imports. Reports like total import by entities, import over time and total imports are available as graphic charts. Import history is listed in the Activities section that displays all the transactions that are carried on the site over time. You can import multiple files with multiple sheets easily and asynchronously. Once a sheet is uploaded, you can track the progress anytime in the header task bar while proceeding to the next upload seamlessly. The software keeps track of the file upload and even if you exit the session in between or during uploads, you will be prompted and taken back to the same page where you left off with all the sheet data and settings restored. Excel Transactions lets you preview and edit your data online with a simple and powerful data grid. This also validates pre-uploaded data and maps all the QuickBooks errors post-upload to the specific cell. Field level mappings are automatic if you use a template and for familiar headers. With the powerful import settings, you can quickly and easily create new entities, adjust date formats for the upload data. You can now be less worried if you had uploaded wrong data. With a delete feature to your help, you can query the uploaded transactions from QuickBooks and drop them anytime! You can query non-uploaded QuickBooks transactions and delete them too, if needed. Before submitting or exporting into QuickBooks online, SaaSAnt gives you an excellent preview of your data in QuickBooks Online Sample Page. What Problems Will SaaAnt Solve? Scenario 1: Customer has an excel file of your invoices and wants to export into QuickBooks Online. SaaSAnt provides an intuitive way to map your excel file into QuickBooks Fields. Once the mapping is completed, then import will be a breeze. Scenario 2: Customer needs to update the product/customer/vendor details frequently. The update feature helps the customers to update their information in QuickBooks Online in batch mode. No need to manually change the information in QuickBooks online. Scenario 3: Customer wants to remove unwanted data in QuickBooks Online. Bulk Delete feature of SaaSAnt helps the customers to delete the unwanted data in batch mode. Companies have different needs and requirements and no software application can be perfect in such a condition. It is useless to try to find a perfect off-the-shelf software app that fulfills all your business wants. The wise thing to do would be to customize the application for your specific wants, employee skill levels, finances, and other aspects. For these reasons, do not hasten and subscribe to well-publicized trendy applications. Though these may be widely used, they may not be the best fit for your unique wants. Do your groundwork, look into each short-listed system in detail, read a few SaaAnt reviews, speak to the vendor for clarifications, and finally select the application that provides what you want. How Much Does SaaAnt Cost? We realize that when you make a decision to buy Accounting Software it’s important not only to see how experts evaluate it in their reviews, but also to find out if the real people and companies that buy it are actually satisfied with the product. That’s why we’ve created our behavior-based Customer Satisfaction Algorithm™ that gathers customer reviews, comments and SaaAnt reviews across a wide range of social media sites. The data is then presented in an easy to digest form showing how many people had positive and negative experience with SaaAnt. With that information at hand you should be equipped to make an informed buying decision that you won’t regret. What are SaaAnt pricing details? What integrations are available for SaaAnt? SaaSAnt integrates with QuickBooks Online. Pros: The ease of use, the myriad of templates and extremely detailed Q&A/knowledgebase. Cons: I have not found any areas to be problematic and any user error I came across was covered in their detailed Q&A/knowledgebase. The ease of use, the myriad of templates and extremely detailed Q&A/knowledgebase. If you need more information about SaaAnt or you simply have a question let us know what you need and we’ll forward your request directly to the vendor.